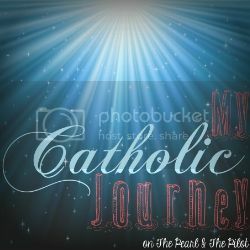 *UPDATE* This post has been linked up to Amanda over at Worthy of Agape‘s Conversion Stories Link-up and Caitlin at The Pearl and the Pilot’s My Catholic Journey link-up. I LOVE hearing other peoples conversion stories so all the people that linked up Thank you! It was a lot of fun to write mine and read them all. After reading so many different conversion stories on the web over the years I started to think about mine. I’m a cradle catholic so I always felt like I didn’t really have one. I was always a goody too shoes and did what was expected of me which included going to mass every Sunday, Religious Education, and learning more about my faith. From the time I was in First grade until I graduated high school I went to Faith Formation EVERY YEAR. I even was really involved in college. Someone from my alma mater even called me last week and asked me what my favorite part of college was and I probably caught them off guard by mentioning my involvement in Campus Ministry. It just always seemed easy and fun to me. But looking back I think a lot of things affected my dedication to STAY Catholic and not convert to some other religion or just stop going altogether. I was born in NYC and where I lived in particular EVERYONE was either Catholic or Jewish. I went to public school but I didn’t really know anyone that was “nothing.” Most of the people I knew were Catholic over being Jewish. And EVERYONE went to Religious Education every year. Kids openly talked about going to church and Religious Education (in casual conversation..as much as that can be in elementary school). It wasn’t until several years ago I heard of people just putting their kids in RE for first communion and confirmation prep only. All my friends received First Communion in 2nd grade and had these big parties. I can remember when I was really young taking going to Religious Education VERY SERIOUSLY. I remember when I was in First Grade we didn’t have school due to a holiday but I still had Religious Education and we had gone to chinatown for lunch and on our way home/to RE we RAN OUT OF GAS! I remember being so upset that I missed class. When I was 8 years old my father passed away of a brain aneurysm and we still practiced our faith but it was different. My dad was a VERY devout catholic. He had this little book of “family rituals” and would pray for everything. He had a little prayer we would say before putting the angel on the Christmas tree, before going to sleep, before lighting the advent wreath, you name it there was a prayer. And after he passed I think it was comforting for me to know how dedicated he was and to make sure I kept going to church because that’s what he wanted. Maybe that wasn’t the best reasons to keep practicing but it worked for me. When I was 12 and in 7th grade my Mom moved our family to Texas. There’s a lot of drama involved in why we moved but basically she had to get away from certain family members and people to make a new life us. As a widow she found it hard to do anything without hearing a million negative comments because she did certain things [alone]. When we moved to Texas it was a little bit of a culture shock in general but especially in terms of Religion. Practically no one was Catholic. Everyone at school was some form of protestant and constantly asking me, “If I was saved.” I had never heard this term before and had no idea what they were talking about [and if I was]. I can remember vaguely being “tested” and challenged about God and religion but I kind of just went with the flow. When other kids tried to invite me to church I would tell them well I go to the Catholic Church. I don’t know if it was my just introvertness/shyness or what but I can remember people talking about things but at the same time I don’t ever remember people trying to convert me either. I can remember talking about how I was baptized as an infant and thinking well my parents chose my faith and a classmate saying how I NEEDED to choose my religion not my parents and how “that didn’t count.” I also remember every fall while I was in late middle school/high school when school and Faith Formation and Youth Group reconvened and we talked about what happenned over the summer TONS of my catholic church friends would talk about how they were all invited to baptisms of their protestant friends at the wave pool and the wet-zone (the water park in town). And we all thought it was kind of strange to get baptized in chlorinated water. For many years especially in late elementary and middle school I basically just went through the motions. I went to RE and Mass but I can remember at times HATING IT. I thought mass was boring and so were the classes I had to take. The teachers didn’t do anything fun and just wanted us to memorize everything. I was confirmed in 9th grade and I did keep going but more because I didn’t really have friends and it gave me a place to socialize outside of school. After Confirmation I can remember having a teacher that really inspired me. She treated us as adults and we would have pretty in-depth conversations. At the beginning of the year she would give everyone a survey with different topics and we would vote on what topics we wanted to cover and based on the results she would cover those topics. She also would have us journal about the readings/homily at whatever mass we went to and it forced us all to really start paying attention at mass. She also really focused on how our Catholic faith was a continuing learning experience and how she was constantly learning about our faith and we needed to make sure we were always learning about our faith as well. As a learner by nature that really motivated me to keep learning and if I don’t know something to ask someone or look it up (which thanks to the internet is really easy to do now a days). When I was a Junior in High School a friend from another parish invited me to her youth group and it was a lot of fun. The church had Lifeteen with a Lifeteen mass with contemporary music that really brought going to mass alive and exciting for me. They also invited me on a retreat, Youth 2000. That was one of the first retreats I ever went on and it was a lot of fun. I remember really learning about the Eucharist at this retreat and it was my first experience of Adoration and Praise and Worship Music. Then my senior year of high school my sister and I along with our youth group and several other parishes attended NCYC (National Catholic Youth Conference). That was one of the most awesome experiences I ever experienced. 30,000 other Catholic teens all in the same place celebrating their faith…so cool. My sister (who really isn’t practicing anymore) to this day STILL talks about how awesome that conference was for her. When I hit college I got to participate in a retreat program called Awakening. It came from the Cursillo movement. That I think was my turning point. After those retreats and hearing so many people’s stories, prayers, and testimonies a lot of things changed. I was happy about my faith and fully believed in it. It just made sense. I had a lot of friends that went to mass regularly and fully believed in the church teachings because they wanted to and not because their parents were making them. I did hear and read about other religions here and there and none of the things I heard or read about made sense to me…Catholicism did. At times I get frustrated with Catholic Churches because we don’t have as many programs, ministries, or events as some of the other religions but I don’t think I could give up the traditions, the smells, the mass, the sacraments, the eucharist just for some “fun” programs and activities. I know this wasn’t really a “conversion or even reversion” story as I never really left the faith. But I think a lot of the experiences I had influenced my faith and are why I never left. 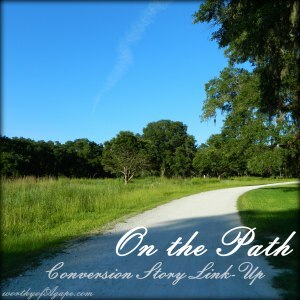 I’ve always wanted to share my faith story on my blog so Amanda’s conversion story link-up gave me that chance. One thing I have learned over the years is that we are NEVER fully done learning about the faith and there is ALWAYS something new to learn as we grow older and learn more everyday! This totally counts toward the conversion story end of things. It’s your faith journey and there are times when you were “converted” to a new way of looking at things. Exactly! After writing this I’ve been thinking how I’ve had a lot of people come in and out of my life that really effected the way I looked at my faith life that without them I’m not sure where I would be today. I’m someone without a conversion or reversion story. I decided to get myself to Mass the first (and all) weekends I was in college and every weekend thereafter. I never had a light-bulb moment; Catholicism is part of who I am.